from the 1950s. It comes inits original box. Ideal for the hipster for beard maintenance. An early 1970s Birds Custard 11oz tin that is still unopened. Excellent label but contents a tad past their use by date. 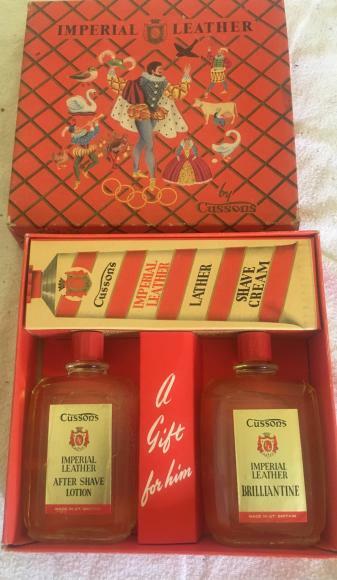 A nice Christmas presentation set of Imperial Leather shaving set which dates from the 1960s. In as new condition, this is a modern Schuco Studio constructor set for a metal car. It has never been out off the box. It comes with the outer sleeve for the box. In nr mint condition, this is an early 1960s Japanese made battery powered 'Bump and Go' tin plate Ford Mustang Mach 1. Fully working and not a mark on it. The box is excellent as well. This is the scarce Corgi The Avengers Gift set no 40 with both cars, Emma Peel figure and all 3 umbrellas. The inner and outer box are both excellent. The Bentley has slight fading but otherwise in great condition. A lovely O Gauge Railway Crossing signal by Louis Marx which comes in its original box. Complete with the electric connectors. 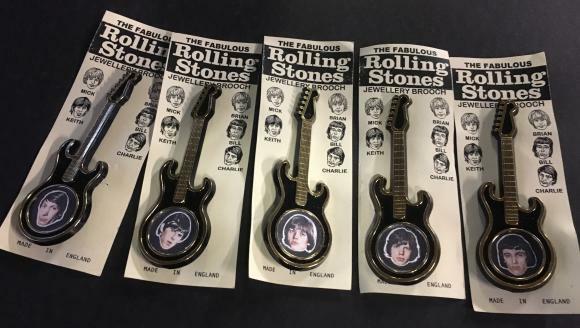 Very rare and in superb condition, this is a full set of plastic guitar brooches for the Rolling Stones. Dated from around 1964 they include Brian Jones.